We’re going to talk about, and I’m going to whiteboard out for you, how you can dominate your local market for as little as $10 to $15 per day. The reality is, you can probably do this for as little as three to five bucks a day, literally the price of a cup of Starbucks coffee. To do so, you might have to invest a little bit more time into the process but still very possible. Because, implementing this process is going to help you grow your personal brand. It’s going to help you get to know, like, and trust, or get your prospects, give them the ability to know, like and trust you to stay top of mind so that when their motivation hits a tipping point, when it comes to buying or selling real estate, they know you, they like you, they trust you, they know your personal brand, they know you’re a real estate professional and they know that you can help them. Business will come to you, business will find you versus you having to constantly chase after it. I’m extremely excited to share this plan because this is the plan I’m implementing in my own real estate practice locally. I’m having an incredible amount of fun doing it and seeing tremendous results in a very short period of time. Those results are only going to climb and grow. I’ve literally only been doing this for less than a month. Now, I just want to double check that we are in fact streaming okay here before we get into this because I don’t want to spend 20 to 30 minutes here outlining this all for naught. So, let’s just double check. If you can, let me know. If you’re watching this live, do me a huge favor, click like and comment like, “Ready to go,” or something like that. In fact, you probably want to grab a pen and paper as well. That wouldn’t be a terrible idea. It does look like … okay, good. Sweet. So, you can hear me and see me. All right. Here’s what we need to do first. Step one … actually, this is like step zero. Laying the foundation. Consider this step zero. We need to put some things in place. We need to install the following on any website assets that we own that might get traffic. Any website assets. Your actual website, if you have a blog, if you have landing pages, stand-alone pages, any websites whatsoever. You need to install these on. You might be able to do it yourself if you’re so inclined or you might have to reach out to your webmaster, whatever the case may be. You need to install a Google Tag. You get that from your Google Ads account, ads.google.com. It’s under audiences. You can install. I think it’s called the Global Tag, Google Global Tag. You need to install this. These things typically will go in the header of your site. Some additional that you might want to … these are like prerequisites. You’ve got to do these too. Some additional that you might want to do that I’m doing is Twitter has a similar tag that you can install. Bing. Yes, people still use Bing. And even, thanks.io. We actually have a couple of blog post on the site, or actually one blog post on the site about how to do this on our clientalchemist.com/blog. You can do this and actually retarget or remarket offline to visitors of your site. So, these are required. You have to do these. These are optional, all right? That’s how we lay the foundation. Then one other foundational thing we want to do is we want to create custom audiences on Facebook. We want to create the following custom audiences on Facebook. We’ll put on FB. Number one, we’re going to upload all contacts as a custom audience. All. Your sphere of influence, all buyer leads that you may have, all seller leads that you may have, all contacts. Now, you might create them as separate custom audiences. In fact, that’s probably a good idea if you have them segmented in your CRM. So, create them as three separate, if you do. If you don’t, it doesn’t matter. It’s fine. The second audience we’re going to create is all engaged with your page. Now, if you’re watching this and you’ve not done anything on Facebook, you don’t have a Facebook page, you don’t have anything like that, don’t worry. Some of this may not apply to you right now, but most of you watching this have a Facebook page of some kind. If you’re watching this, you’ve probably been following me for some time. You’ve done some ad campaigns, you’ve done some marketing on there. But again, if you haven’t, don’t worry about this because I’m going to show you how very quickly and very affordably, you can build these if you haven’t done some of the groundwork or the legwork of this. So, we’re going to create a custom audience of all engaged with our page. We’re going to create a custom audience of all video views. This is of all lead form clicks. That’s people who have clicked on one or more of your lead forms. This would be if we have had our Facebook pixel installed on our site for any length of time, we’re going to do all website traffic. So, these five audiences, and again, some of you may not be able to do this all at once or up front but this is laying the foundation. These are the audience buckets we’re going to have as we move forward and implement. So, that’s step zero, that’s laying the foundation. Now, we need to talk about building the audience. Step one, building the audience. There are several visuals we could use for this. We could use a funnel, we could use a pipeline. There are multiple ways that this can be depicted. The idea here is that, now that we’ve laid the foundation, we need to put people into that pipeline. I like a pipeline more than the funnel reference, personally. I’m just going to draw a pipeline here where over here are people that they don’t know you exist, or maybe they do on some level but they don’t have any motivation to buy or sell right now. They’re on this end of the pipeline, and this end of the pipeline is, they are a client. We need to start priming the pump. Can you picture one of those old, tiny pumps, the water pumps that you would find on a well on an old farm? We’ve got to prime the pump. Depending on how active you have been online marketing your business or just in general marketing your business, depending on how long you’ve been doing that or not being doing that, it may take longer to prime the pump. Sometimes, it takes a long time to prime that pump. Other times, if there’s things already working or maybe it had recently been primed, it doesn’t take as long, but we need to think about priming the pump. That’s how we’re thinking of this, priming the pump. All right? Well, we need to do several things to build this audience. We need to put people into the pipeline. Now, for a very long time, the primary means that we taught and believed in when it came to putting people into your pipeline was getting them to opt in. Getting them to opt in for something. By opting in, they’re exchanging their contact information for something that you are promising them. However, with the ability and with what we’ve done in step zero, laying the foundation, anyone who connects with us on any level, what I’m doing then or how I’m treating that is as though someone opted in. It’s almost like an invisible opt-in or an invisible audience. That’s all we’re trying to do here is get people into the audience. Now, how are we doing that? What are we doing specifically to get people into that invisible audience, that invisible opt-in? Well, we have paid ad campaigns. We have paid ad campaigns where people actually are opting in. Where there are seller leads, maybe we’re doing our just sold report, or a home valuation, or a house prices report. These are all variations of the same thing, or buyer leads. We might offer a free list of X, Y or Z. Could be price reduced, could be foreclosure, could be a new construction, could be town homes, blah, blah, blah. Whatever. We use these paid campaigns to drive people into the audience. To start getting people into the audience. Here’s the difference though between now and yesteryear, let’s say. Anyone who engages with this are now part of my audience. So, we don’t need them to opt in. Do we want them to opt in, do we want them to provide their contact details to us? Sure, absolutely. Yes. However, we don’t need them to because just the fact that they’ve engaged with this offer, because we’ve laid the foundation correctly, we can then put marketing messages in front of them. I’m getting a little ahead of myself but I hope you’re grasping the power in that. How else are we going to put people into the audience because it’s not just paid ad campaigns, there are a number of free strategies that we can do. So, blog posts, video content, you can shoot market updates, property tours, quick tips, you can talk with lenders. The ideas here are limitless. In fact, if you want, I have a working document that I am putting together and building out with examples of the videos that I’m creating in my local practice. If you would like a copy of that, just send me a private message and I’d be happy to send that to you. All right, so video content and just posts on Facebook. Sharing local information, local events and so forth. Then depending on the type of content, we can share it in groups, on your personal page, etcetera, etcetera. Again, it goes back to, if we’ve laid the foundation correctly, all of which means, anytime someone engages with this, that we’re putting them into our invisible audience bucket. I’ve got a full plan. Here’s what I’m doing personally. Right now, I have a seller lead ad campaign running. I’m not focused on buyer leads right now. It’s just … for me, I’m not. I am using though some free … Actually, here’s a great one. I can’t believe I forgot this one, property search posts. I can’t show you an example of this while I’m live here but maybe after the fact, I’ll put one in the comments. But basically, what this is, from my website, I’m taking a property search result. For example, I’m bringing up all the recently price reduced properties and I’m just sharing that on Facebook. Then, when someone engages with that, when someone clicks on that and comes over here, because I’ve laid the foundation properly, I can then retarget or remarket to anyone who clicks on those. People love those kind of things. So, what can you do with those? You can share a property search post of all the pool homes available right now. All the homes with a view right now. All the homes with a high walk score, or all the just listed properties, or all the price reduced properties. All the homes that are open for the weekend. The ideas and list is limitless. What I’m running here to build the audience is, I’ve got sale of week campaigns and then I am blogging on a regular basis, almost daily. On Monday, I do this. On Tuesday, I do this. On Wednesday, I do this. On Thursday. I’m shooting this video for you on Friday. By Friday, blog post content, which by the way, I’m just checking the time. By Friday, blog post content is this. I compile, I aggregate all the local events coming up for the weekend. How do I do that? Well, I go to Facebook.com/events, and I look for the local events, which Facebook will do naturally for you. Then I look for this weekend. I just build out a simple blog post and then I share it on my Facebook page several times. I share it Friday morning, Friday evening and Saturday morning. That’s just one of my strategies. Tuesday is my market update video. There’s a fairly recent blog post on our clientalchemist.com blog showing you an example of that. It’s just taking a quick tour, a quick market update, what’s happened in the last seven days. New properties that are listed, properties that have been reduced, properties that have sold, etcetera, etcetera. I do post blog posts about featuring local neighborhoods or subdivisions where I just do a little summary about it. Blog posts about or focused on spotlighting local businesses and then I do that. I rinse and repeat every week. Now, again, I don’t have a ton of these built out yet because I’ve literally just started implementing this locally but that’s the kind of stuff that I’m doing to build this audience to prime the pump. Step two is growing and connecting with the audience. It’s that consistent implementation of your plan. Now, I say your plan because I’m trying to share my plan but ultimately, you’re going to find what works for you, and make it your own, and pick out the things that fit for your personality and your skill set, etcetera. But by consistently doing it over time, we’re going to put more people, we’re going to grow it, and we’re going to put more people into there and we’re going to connect with more of those people in the audience. Now, step three, the final step is getting into conversation with them. This is where it gets really exciting, where I have had the light bulbs go off for me in ways that I haven’t … Conversing with the audience … In ways that I haven’t been able to make in the past. So, if you’re tracking along with this, we have bucket number one, which is our invisible audience. Bucket number two is our … we’ll just call it, for lack of a better term, our visible audience. People that have actually connected. Then bucket number three, we’ll come back around here, that’s going to be in conversation. This is really, they’re a client at this point. They’re either a client or they’re going to be a client. What does this look like? We lay the foundation to make sure that we’re able to build this invisible audience. We put offers and content in front of this invisible audience so that they can connect with us, they can opt in on our website, they can opt in on a lead form or on a survey or any number of ways. They might call, text you, email you, etcetera. Then, we strategically use retargeting and remarketing campaigns to get into conversation with more of those people. So, we have campaigns and content designed to do A, campaigns and content designed to do B, and campaigns and content designed to do C. So, what are we doing here? What kind of messages are we doing here? That’s what I would be wondering if I were you. Number one, a thank you video. This goes to all of the IA, we’ll call invisible audience. So, simple, simple, simple. That’s number one. Number two is a seller-centered video. I’m putting this in front of anyone who is in this invisible audience bucket who has engaged with seller-centric offer. Anyone who’s clicked the lead form that was a seller-centric offer, anyone who’s clicked over to a web page that was a seller-centric offer and anyone who has taken an action that would indicate that they are a potential seller. What I do in this is thank them and let them know, if they’re thinking about selling, there are three free services that I offer that they can take advantage of anytime they like. Super easy. Next, which I haven’t implemented yet because I haven’t implemented this part, is a buyer-centric video. So, anyone who is the same as the seller but anyone who has clicked on something that would indicate or engage with something that would indicate that they have an interest in buying a property, I would do the same thing. Thank them and let them know that if they’re thinking about selling, whenever they’re ready, there are three free services that I offer that they can take advantage of at any time. Where I’m promoting these videos is on Facebook and YouTube. I will be testing also on Twitter and I’ll be sharing those results for those of you interested as well. I’m putting these videos back in front of these folks on Facebook and on YouTube. On Facebook, it’s pretty simple and straightforward. They will see the video in their newsfeed on the desktop or mobile if they have engaged with anything here or with anything seller-centric here or buyer-centric here. The YouTube, what we’re doing with that is we’re running in-stream ads, which are those videos that play as commercials in front of a YouTube video. I’m sure you’ve experienced this where you’ve been watching a YouTube video or you wanted to watch a YouTube video and an ad plays in front of it, maybe for QuickBooks or for, I don’t know, any number of things. Well, you can put your video in as an ad like that. Think about that from a branding perspective and just think about this compared to doing billboard ads or radio ads or TV ads. You’re getting the same effect but you can get it for $10 to $15 per day or less. Let’s talk about that, and how am I doing on time? All right, I’ve got a few more minutes before I need to wrap up and come in for a landing because I have an appointment coming up. So, I mentioned at the beginning, for $10 to $15 per day. Here’s how we break that budget down. If you’ve got the $10 to $15, then how I would break this down would be, for lack of a better term, and I’ve heard this … I didn’t invent this but your top of funnel or top of pipeline lead generation type of campaigns, and $5 per day for your retargeting. If you’re on a tighter budget, let’s say, and you have $3 to $5 per day, then what I would do is I would spend more of your time on the free strategies, the blogging, the video creation, sharing content, etc. Creating that and then sharing into groups and things of that nature. I would spend … you could do $1 to $2 for building and growing, and you could do $2 to $3 or even all of the $3 to $5 for connecting and conversing. The retargeting, the thank you, the seller and letting them know whenever they’re ready, that kind of stuff. I hope you are making the connections and seeing the opportunity that lies in all of this. I’ve shot this as a follow-up to a couple of videos that I created earlier this week. In fact, yesterday, I did a video showing you, if you remember, the thank you video and the seller-retargeting video. We’ve got on our blog, on our YouTube channel, on this page here that if you’re watching this on my Facebook page, where I show you actual examples of what those videos look like. They’re super simple. The one’s under a minute, the other one’s under two minutes. It’s like a minute and 41. The seller one’s a little bit longer. So, that’s the big picture of this whole process. Now, if this is making sense to you and the light bulbs are going off but you’re just feeling like, “Man, I just don’t know where to start with this. I don’t know what to do with this,” then here’s what I would encourage you to do. Send me a private message and I’ll let you know the ways in which we can help you implement this process. There are several options. What I would encourage you is in one way, shape or form, whether it’s with our help or not, you need to figure this out because I’ve said this many, many times this week; this is the biggest, the greatest opportunity that I have ever seen and I’ve been doing this for nearly 12 years now. There has never been an opportunity like this to grow your personal brand, to attract and connect with and get virtually 100% of your target market who might be thinking about buying or selling real estate, to get them into your sphere of influence and to be able to stay top of mind with them so that they know, like and trust you, know that you’re a real estate professional and know that you can help them when their motivation hits a tipping point. There’s never been an opportunity this great as what is available to us right now. It’s why I reactivated my license and I’m jumping in with both feet, and it’s why I’m excited to help you, more of you implement the process as well. So, if you would like help with that or more information about that, just send me a private message or even comment, “More info please,” or whatever, and I will be happy to follow up with you. Also, if you have any questions, I know this is a lot to take in, let me know in the comments as well. I’ll be happy to answer any and all of your questions as well. Thanks for taking the time to check this out. It was a bit of a long one. Hopefully, you got a ton of value from it. Hopefully, we’ll be talking real soon about implementing this process. There’s nothing on the board now but you get the idea, the process that we just walked through into your business so that we can help you create that celebrity authority type of status in your market. Grow your personal real estate brand, sell more homes and here’s the big one, choose who you get to do work with, who you get to work with. 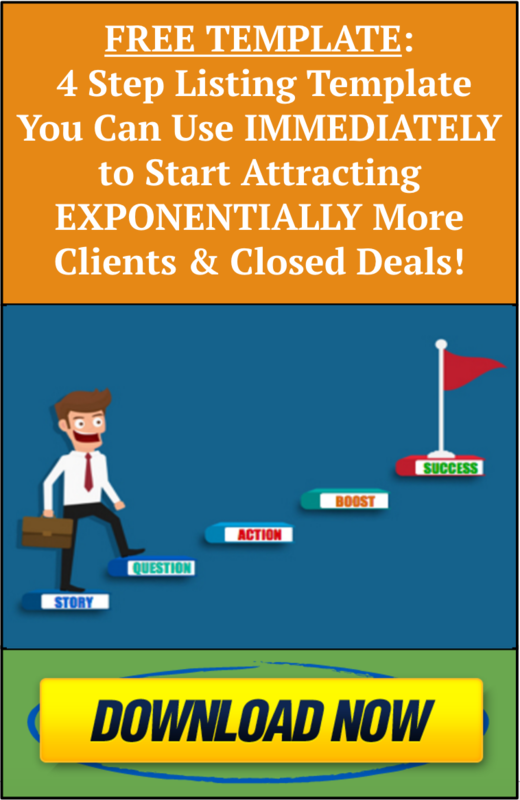 Build a scenario where so much businesses is coming your way, you get to pick and choose the clientele that you get to work with. It’s a big one and it’s possible for you when you implement the process that we just walked through. Hopefully, we’ll talk real soon, and I look forward to hearing from you.